Geocentric perspective from Stockholm, Sweden. If the sky is clear you can see the blood red moon in the west hanging low on the horizon. All you have to do is to go out early Monday morning 6 – 7 am. There is always hope despite the challenges. This full moon brings up tension and control issues that we can relate to the dominance of Capricorn and Saturnian energies that many of us may have experienced lately. Now that the south Lunar Node is in CAP we collectively try to let go of too much hard drive and ambition to reach goals. One of my teachers always said: relax and breathe and go with the flow, which is more the voice of Jupiter and Sagittarius. There is actually a strong soothing influence from the two fortunes, Jupiter-Venus conjunction in SAG. In this chart they are seen brightly above the horizon in the east. The Moon is also visible in the west forming an aspect, trioctile, with the fortunes which further suggests faith, love and creative endeavor by the royal feminine that she symbolizes. Two other goddesses are seen above the horizon: Ceres the Grain goddess and Pallas/wisdom. So, on the surface it looks really good here. 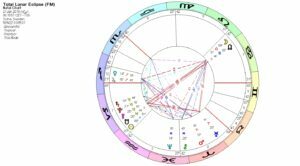 If we look at the chart’s anchor, lowest below the earth, we find Uranus almost on the midpoint between the Sun in Aquarius and the Leo Moon. Uranus helps us to wake up and rebel. He makes us aware but can also surprise and pop up anywhere especially when it comes to structures in the ruling class, governments, high ranked executives and those who govern our lives. This applies both on the collective as well as on a personal level. The changes that we’ve seen come about over the last 7-8 years are still manifesting and eventually the rights of the people will come through. 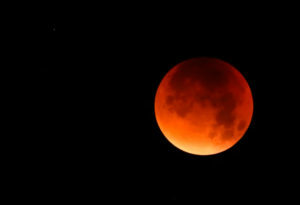 Because Uranus rules Aquarius, the sign of brotherhood, liberty and equality this Lunar eclipse with the sun on the first degree of AQU strongly promotes that awakening that propels us in to the new age of transparency and societies based on human rights. It is also a forbearing of the new cycles that will start in 2020 as Jupiter and Saturn shall conjoin on this AQU first degree on December 21 2020. We live in a time of many conflicting forces as the new meets the old. It is evident that our old systems cannot support the needs of the sprouting seeds of new generations of diamond- crystal- and gold-children. So what’s the solution? 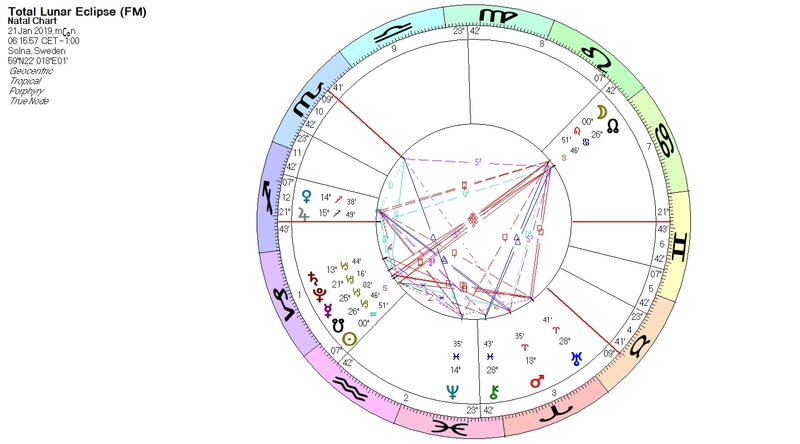 Well, the two fortunes, Venus and Jupiter are squaring Neptune in Pisces, the symbol of forgiveness, dissolution, spirituality and unconditional love. We need to quiet our mind to hear the still voice of the heart. We always have a choice, the freedom of choice to think and act peacefully. Change always begins from within. The outside world is a mirror of what goes on in the inside. If we want to have peace in the world, we need to start with peaceful thoughts and compassion. That energy will eventually create ripples and affect everyone in the Universe. Because we are One. We may not see the result immediately but trust and believe that it will happen.